Fable, at 558 Castro, had its soft opening back in February, but i didn’t get around to trying it until last Tuesday with my friend Tony. Even though the opening is still fairly soft in that there’s no sign outside or indication of what the hours are, it’s already thoroughly Discovered, as i discovered when i walked in at 6:30 and inquired about a reservation for two in the garden at 7:00. At least the maitre d’ didn’t laugh at me. The garden’s not open yet and won’t be until late this fall. And the tables were already reserved for the evening. The good news was that there were still a couple of seats at the bar, which i grabbed. They’re not bad seats, actually, since you’re sitting right there in front of the chef and the cooks and get to watch the show. The chef looked familiar, but it was only after i’d done some digging around on the internet that i discovered why – he’s Jon Hearnsberger and was the chef for some time across the street at the Anchor Oyster Bar. And he’s good. Very good. Which explains why they’re already fully booked on a Tuesday night. I had the pork cheeks appetizer, and they were delicious, arrayed on a bed of mixed greens lightly anointed with the best vinaigrette i’ve had in some time. My entree was the Petrale sole, delicious, accompanied by sauteed spinach and fresh green garlic mashed potatoes, the latter a bit oversalted but wonderfully garlicky. We split a bottle of California Pinot Noir that was a great bargain at $48. Tony wasn’t up for a dessert, so i let him have a couple of bites of my chocolate mousse topped with a salted chipotle cream. The mousse was good, and the cream pushed it up to excellent. The restaurant gives great value, as the most expensive entree was $22. I look forward to many happy returns. Give it a try, but pull it together and make a reservation. 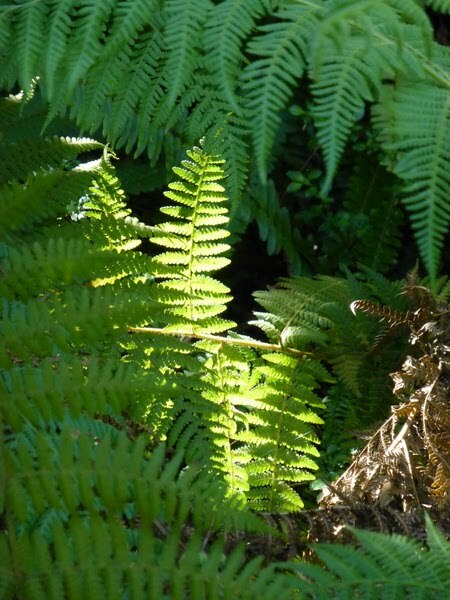 Meanwhile, here’s a ferny shot in Golden Gate Park’s AIDS Memorial Garden.